Posted on March 26, 2019 March 25, 2019 , in Above Ground Pools. When the weather begins getting warmer, people start dreaming of having their own backyard pool. What could be better on a hot day than stepping out your backdoor and jumping into a pool of cool, refreshing water? Well, of course, there are some things to consider when it comes to actually installing a pool in your yard. One of the main factors is price. We often get asked, “Are above ground pools expensive to maintain?” The answer is dependent on several factors. In this article, we’ll attempt to outline the costs of installing, running and maintaining an above ground pool. There are several different types of above ground pool available that vary in cost from as low as $25 to as much as several thousand dollars. At the lower end of the price scale, you can buy a decent sized inflatable pool, blow it up in your backyard, fill it up with water and be cooling off on the same day you bought it. You won’t need a pump or filter system and if it gets too dirty you can just empty it, scrub it down and refill it with fresh water. Inflatable pools are excellent for renters and make for great spur-of-the-moment purchases when the weather is right. They likely won’t last for several years, but they can quickly do the job in a pinch. Ring pools are more permanent than inflatable pools and could easily be used for several seasons if they’re cared for properly. They’re composed of an inflatable ring around the top which floats and raises the walls as the pool is filled with water. Quite often ring pools come with a pump and filter system to keep the water clean. This means you won’t have to completely empty it all the time. However, you’ll have to invest in some chemicals to keep the water pure. The amount you’ll need will really depend on the size of the pool and the amount of use it gets. That said, you can get a decent sized ring pool for less than a couple hundred dollars, so the initial investment isn’t a whole lot. 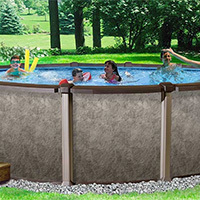 Framed pools are the most expensive of the above ground pool types. On top of the cost of the pool itself, which could reach several thousand dollars, you might need some help with installation and setup. Although it’s entirely possible to do it yourself, if you don’t do everything correctly you may run into bigger problems down the road. Once installed you’ll have to maintain the filter system, water pump, and heater as well as maintain the chemical balance of the water. You’ll also need to invest in some tools to keep the water clean such as a skimmer net and vacuum system. Now that you know how much it costs to maintain an above ground pool, download a brochure to learn more about our models.